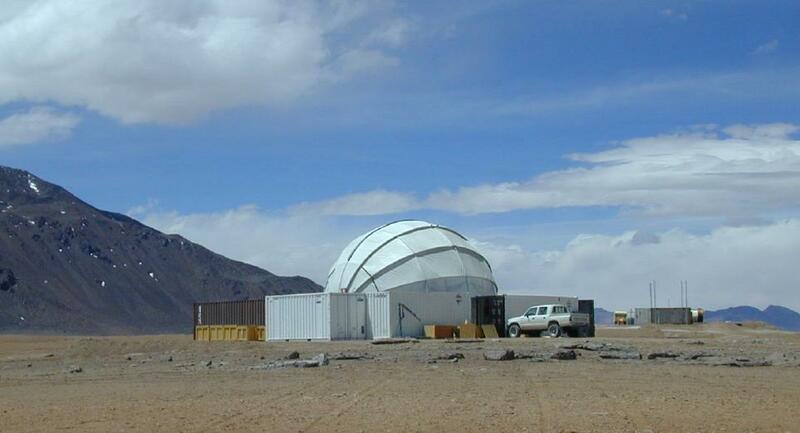 The Chajnantor Observatory is on a high, dry site to ensure that atmospheric brightness fluctuations do not limit the sensitivity of the instrument. 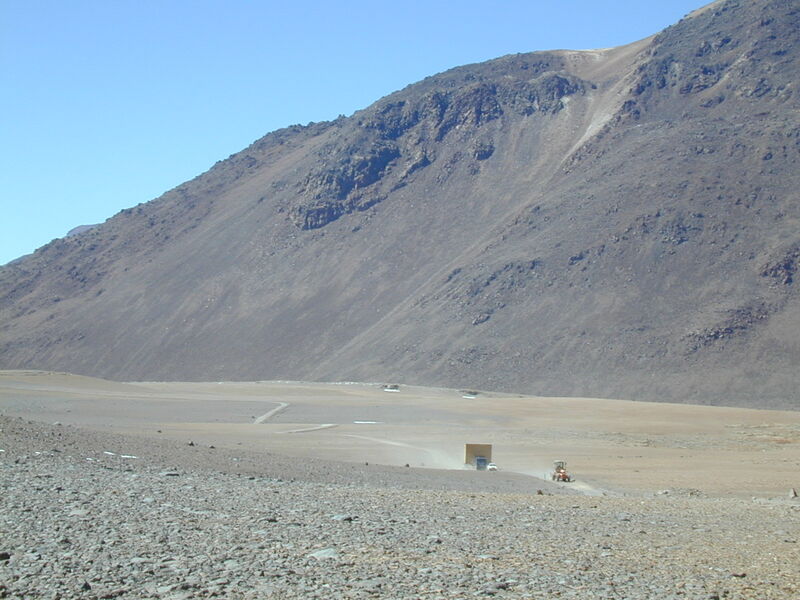 The facility is located at longitude 67° 46' W, latitude 23° 02' S. This is at an altitude of 5080 m about 40 km east of San Pedro de Atacama in Chile. The site is near the center of the 10-km plateau of Llano de Chajnantor and the horizon is below 6° except for one peak at 8°. It is close to the center of the Atacama Large Millimeter Array, currently under construction. The Llano de Chajnantor in winter 1996, looking down from Cerro Toco. The CBI arriving on the Llano de Chajnantor (August 1999). The first observatory instrument, the Cosmic Background Imager (CBI) is housed in a retractable dome to provide some protection from rain, snow, and wind. On most days, the wind at Chajnantor peaks late in the afternoon at about 15 m/s (30 mph). Under these conditions wind chill is a severe problem, but the dome provides a sheltered work space where we can repair and maintain the CBI. The dome is a hemispherical steel frame covered with polyester cloth, sitting atop a 2 m high wall 10.5 m in diameter. Each half of the dome has four segments that nest in a compact ring round the wall when the dome is retracted. The dome can be opened and closed manually or using an electric winch. The wall has a 2 m wide walkway round the top to facilitate access to the telescope. The CBI dome and support facilities (October 1999). The CBI and its dome require concrete support pads, but this is the only site construction work. All the other facilities are in standard ISO shipping containers placed directly on the ground. This modest approach to site infrastructure reduces costs, reduces our maintenance load, and has a fairly low impact on the environment. The observatory facilities include a control room, laboratory, machine shop, power plant, two workrooms/bedrooms, and a bathroom – all within the shipping containers. All the equipment required for repairs and modifications is at the site. Additional containers used for storage are placed around the dome to provide a wind break. To counteract the effects of high altitude, the air in the work and living areas is oxygen-enriched (using molecular sieves to separate oxygen from the air), and people working outside can wear portable oxygen tanks with demand regulators when necessary to improve efficiency and safety. The power plant and fuel tanks are located about 100 m east of the CBI; the average power consumption for the site is about 100 kW and the power plant has a pair of diesel generators rated for 150 kW at 5000 m.
The base facilities are located at the Residencia Don Esteban in the historic oasis town of San Pedro de Atacama at an elevation of 2500 m. These include bedrooms, kitchen, conference room, and computer room. Copyright © 2008 California Institute of Technology. Page update: 2008 March 11.